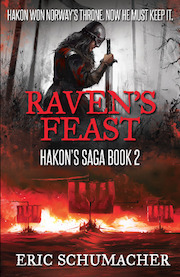 Hakon won the battle against his brother Erik Bloodaxe and the High Seat of the North. But now he has to find the way to keep his seat against rebellious and ambitious jarls with changing alliances. Of course, there are people who are not that thrilled with their king’s religion, or his wish to convert his country to Christianity. This was another action packed book, which was read rather quickly. Hakon is a likable character who undoubtedly makes mistakes, sometimes rather big and rash ones. He still seems at times little naïve and young but it will be interesting to see how he will turn like. Will he become more Viking like in his beliefs and make compromises? He seemed to become a bit more comfortable with killing and such. He is still a boy so it will be interesting to see what kind of man he will be.